Cop to Clinician: Retired Police Lt. David Bond Psy.D. David Bond, Psy.D. : is a registered psychological assistant under the supervision of Dr. Jolee Brunton. He began working for Focus Psychological Services in summer of 2016. His clinical experience includes working at the San Diego Psychiatric Hospital and CRF Vista Balboa group home facility. Additionally, he counseled military combat veterans at the San Diego Vet Center before coming to Focus. 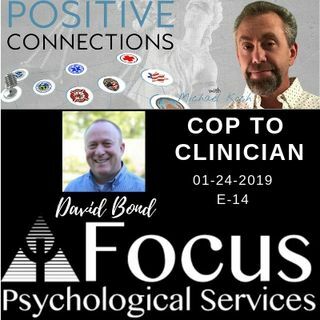 Prior to his work at Focus, David was a sworn police officer for over 27 years and involved with his ... See More department’s peer support team. He is trained in Eye Movement Desensitization and Reprocessing (EMDR) and Rapid Resolution Therapy (RRT). He was on the Trauma Intervention Program (TIP) board for four years and currently is a member of the Salvation Army Advisory Board at the Joan Kroc facility in San Diego. He also serves as an in-service law enforcement trainer for PERT. David is committed to assisting emergency services personnel and their families with their psychological needs.